This Great Value LED Light Bulb replaces the traditional incandescent bulbs with a long-lasting, economic alternative. It will last up to 20,000 hours, which saves you time from replacements. This Great Value LED bulb is eco-friendly by drawing only 9W of power (compared to 60W of older bulbs). Plus, the A19 shape and medium (E26) base make it a perfect light bulb to use in almost any home lighting fixture. Light Bulbs That Pay For Themselves! My average electric bill in the fall has been about $35-40. I replaced every light bulb in my house that I use a lot. In the month of October 2015 my electric bill was $19.00. I replaced ten light bulbs and they have almost paid for themselves in one month. At current prices anyone would be crazy not to exchange your incandescent bulbs or fluorescent bulbs for LED light bulbs. I cannot yet attest to their longevity because I have not been using them for very long. 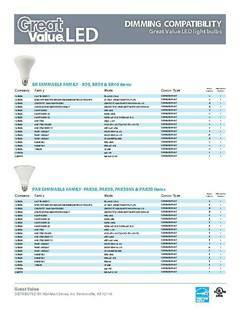 These Great Value LED bulbs have a great price and are the least expensive I have found so far. Purchasing these LED bulbs should allow me to shave off about $240.00 per year. I wish I had done this sooner! Being a senior on a very low income, I am always looking for ways to cut down on utility bills, in particular electricity. These lightbulbs give me excellent brightness, and you'd be amazed at how much they do cut down on the usage on my electric bills! An excellent product, and a very affordable price!!! They may even last longer than I do, considering I'm already 80. (Chuckle.) I highly recommend them. Perfect for replacing twisty flourescents. I've only bought 2 of these so far... but I will keep buying one or two every now or then. Price seems right. Works ! Saves power... Good choice for replacement of any normal incandescent bulb of same lumens that's not on a dimmer. Hopefully last a long time - rated for open or enclosed lighting, indoor or out. Non Dimmable. Seems a thicker glass than a normal incandescent. Seems pretty tuff. I did the math roughly on how long for payback on electricity for replacing one 14 watt twisty fluorescent here that usually last about 3 yrs. It burns non-stop. Just a few months before it pays for itself completely in energy savings. Cool.. and it seems the very nearly the exact same lumens as that nearly 3yr old bulb. Hope LED lumen depreciation is low. From what I've read its pretty good. Best light bulb deal I found to add with my online grocery order. I bought enough of these to replace all the bulbs in my house. I like that they are energy efficient and will save money while lasting much longer so I don't have to change them ofter especially because I have 10 foot cielings so changing a bulb is a job.